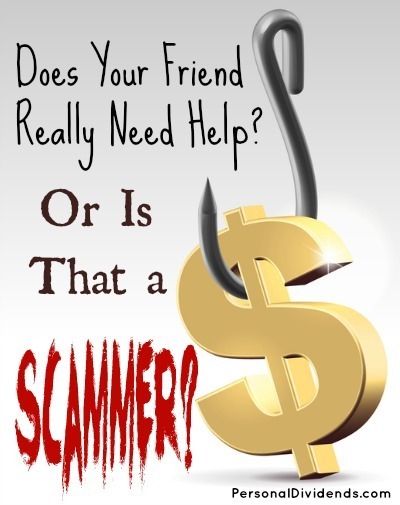 Email Scam: Does Your Friend Really Need Help? Or Is That a Scammer? Does Your Friend Really Need Help? Or Is That a Scammer? As society becomes more open, and as more personal information is made available online, there is a chance that some of that information could be used against you in order to get some of your hard-earned cash. We all want to help our loved ones when they are in need, but it’s important to be on the look out for email scams. These days, a quick look on social media can provide a scammer with just enough information to convince you that he or she is a friend or a family member in trouble. In many cases, the scams take the form of a friend of yours stuck in a foreign country. Someone calls you, claiming that he or she was mugged, and that all of his or her money and identifying documents are gone. In order to get new documents, and fund an egress from the country, you need to wire money. Often, information, ranging from your phone number (if you aren’t careful about your privacy settings) to the names of your friends, can be found on social media. It’s even possible, depending on what your friends post (and how public that is), for a scammer to use the information against you. If your cousin posts that he is in Thailand, a scammer can call you, posing as your cousin, and claim to need bail money because he was in a car accident. A few other tidbits, slipped into conversation, can provide you with a convincing picture. If your cousin doesn’t sound quite “right” that can be explained away by injury, a poor connection, and panic. Because you are concerned for your cousin — stuck in a squalid jail with few human rights protections — you anxiously wire the money. While this email scam can be used on just about anyone, seniors are especially susceptible. The FTC has reported more than 40,000 family emergency scams since 2010, many of them focused on grandparents who panic over what has happened to a grandchild. Often, grandparents promise to keep the details a secret so that the grandchild doesn’t get in trouble with his or her parents; this prevents a grandparent from making a call to verify the situation. First of all, be suspicious anytime some calls you out of the blue and asks you to wire money. Money transfers are so popular because they are virtually untraceable. Once you send the money, it is basically gone. It’s picked up on the other end — never to be seen again. And you can’t find out who picked it up. Even though your concern for a loved one is likely to overwhelm the alarm bells in your head, make sure that you retain your suspiciousness, especially if you are being asked to wire money. Next, confirm. No matter what your cousin or buddy or grandchild says about not wanting to get into trouble, make the call. Your first phone call should be to the person’s actual number. Just verifying by calling your loved one’s true cell phone number can cut off scammers immediately. You can also confirm by contacting a parent, child, or spouse of the person in question. Until you receive actual confirmation, don’t send any money. Chances are, though, that you aren’t going to receive any real confirmation; you’re most likely to discover that the whole thing is a scam. And don’t forget to ask yourself why the person would be calling you and asking for a wire transfer. Make sure you are truly assured of the other person’s identity with more evidence than a few key events and memories. If something doesn’t seem right, and you are a little suspicious, pay attention to those gut feelings and avoid wiring the money.